THE four-seater flying boat which forms the subject of the following notes and illustrations has been produced especially with West Coast of Canada conditions in view. These conditions are severe. Machines are often out ДальшеMore>>> on operations for several months at a time, and then any maintenance work must be done by the pilot and engineer, the only workshop available being very likely that of some fish cannery situated, perhaps, some hundreds of miles up a rocky coast. In designing the "Totem" it was, therefore, necessary to aim at the greatest possible simplicity of construction, and also to provide such robustness that considerable rough handling by inexperienced helpers would not cause any damage. In trying to assess the merits of the machine, it is necessary to bear these facts in mind. For instance, the ratio of gross to tare weight is 1.48 (the machine carries 48 per cent, of its own weight as disposable load). This is not a remarkable value, certainly, but the need for rugged construction may easily explain it, and the ratio is no lower than that of many other aircraft which have done good work. The "Totem" was developed last year by Boeing Aircraft of Canada, and it is not without interest to learn that it was designed by an Englishman, Capt. E. F. Elderton, who as far back as 1918 worked at the Rochester works of Short Brothers, Ltd. Owing to the need for guarding against rust and corrosion, stainless steels have been used extensively. For instance, all wing fittings, hull fittings, wing-tip float fittings, and tail fittings are of stainless steel, as are also such smaller items as bolts, nuts, pins, cotter-pins, etc. During last summer the Boeing "Totem" was given extensive trials, which included alighting on and take-off from Garibaldi Lake with full load. It should be explained that Garibaldi Lake is situated in the mountains, at altitude of about 5,000 ft. During the tests the "Totem” took off from the lake without difficulty. We are not aware what were the water conditions at the time, but it seems likely that the water was fairly smooth, with the waves to help the machine into the air. It is thought that this demonstration proved the suitability of the "Totem" for main purposes on the British Columbia coast, such as fishery patrol, forest patrol, mining and prospecting operations, and many others of the various uses to which aircraft can be put in developing of natural resources of the country like Canada. The hull of the "Totem" is of conventional design, and is constructed of "Alclad," metal "three-ply” material consisting of the central layer of duralumin sandwiched between the layers of aluminium. The hull frames are spaced approximately 17 in. apart and longitudinal stringers run from stem to stern of the hull bottom. The "Alclad" skin is riveted to frames and stringers. The hull sides and the deck are planked with sheet "Alclad" in which fore-and-aft corrugation are formed for stiffness. On the deck these corrugations suffice to get enough stiffness to all the crew to walk on the deck, but on the sides of the hull, also longitudinal corrugated, extra stiffness and bracing is provided by diagonal members between frames. Five bulkheads divide the hull into six watertight compartments. 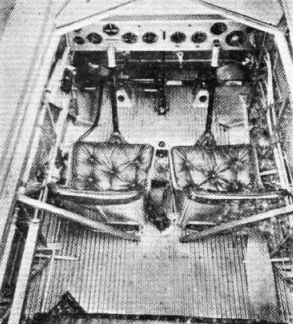 The cabin is in the forward part of the hull, ahead of the front spar of the wing, and one of the small photographs published shows that for such a small machine the cabin space is quite roomy. The seats are arranged by two side-by-side pairs, and dual controls are provided for the occupants of the front seats. Diagonal members bracing the hull sides laterally occur between front and rear seats, where they are not in the way. The cabin flooring is in the form of corrugated metal sheet. The upholstery is in natural leather. The monoplane wing is of the usual two-spar type, but is somewhat unusual in that the spars are of spruce, while the ribs and leading and trailing edges are of chrome-molybdenum steel tubing, spot-welded together. The wing covering is fabric. At their root the wing halves are bolted to the top rails of the hull, and outboard the wings are braced by steel struts at rather a flat angle. One would imagine that what with the external wing bracing struts joining their lower ends to the hull on the chine, and with a planing bottom showing no flare or reversed curvature towards the chine, the boat would be extremely “dirty" at certain running speeds. Whether or not this is so we have not heard. The fin, rudder, tailplane and elevator are of welded steel tube construction and fabric covered. The tailplane, it will be noticed, is placed at the top of the fin, and is strut braced. A special water rudder is housed in the lower end of the air rudder, into which it can be drawn up, much in the manner of a centreboard in a boat. The water rudder is so arranged that it hinges freely in its slot, so that, should it strike an obstacle while the machine is taxying, it rises clear until the obstacle has been passed. The Pratt & Whitney "Wasp Junior" engine is so mounted on struts above the wing as to drive a pusher airscrew. This is an arrangement which FLIGHT has long advocated and has the advantage, among others, of removing the airscrew from the vicinity of the cabin roof, so that there can be no risk of passengers or crew working through the open hatch getting anywhere near the revolving propeller. Another advantage is that the airscrew is as far as possible removed from the cabin, and, moreover, is behind the passengers, so that the amount of noise which reaches the passengers is reduced. The fuel system includes a main petrol tank placed inside the hull and a service gravity tank in the engine nacelle. The main tank is situated in that part of the hull which lies between front and rear spar frames. The fuel is raised by a power-driven pump (an auxiliary hand pump being provided) to the gravity tank in the nacelle. The overflow from the nacelle tank to the main tank passes through a sight feed on the instrument board. The engine is fitted with inertia hand starter. The controls are so arranged that one set can be removed if dual is not required. The usual control stick and foot bar operate the control surfaces via steel tube pull-and-push rods carried on special roller bearings. The rods which operate the elevator and the tailplane trimming are neatly arranged inside the fin, so that a few feet of rudder rod is all that is exposed. It is reported that on tests the machine has been found to handle nicely both in the air and on the water. If the engine is suddenly shut off during flight, the machine automatically drops its nose and, after about three slow oscillations, settles down to a steady glide. At cruising speed the machine is said to fly "hands and feet off." 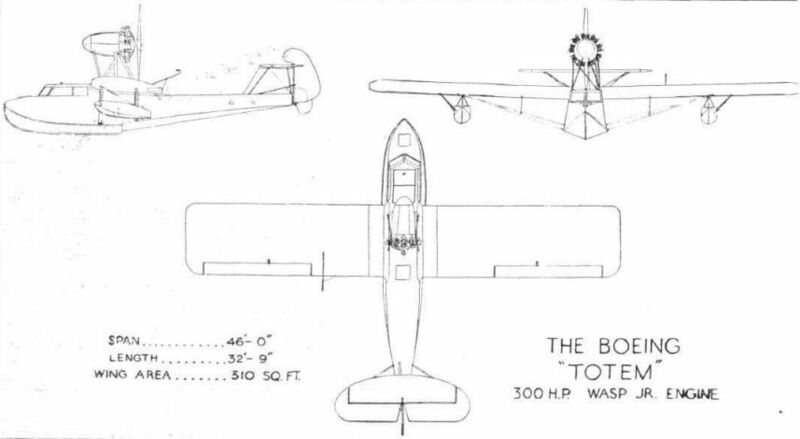 It is not without interest to compare the "Totem" with the Saro "Cutty Sark," which is the nearest British machine in power, weight and wing area. The "Cutty Sark" has a smaller gross weight (3,700 lbs) lower power (210 b.h.p.) and lower wing area (320 sq. ft.). Thus one would expect the "Cutty Sark” to have a lower top speed and also lower landing speed, which actually it has. The speed range of the machines is almost identical, ratio of gross weight to tare weight of the "Cutty Sark" is better than that of the "Totem." The minimum drag coefficient of the two machines as expressed by the Everling "High Speed Figure," is almost identical, this figure being 12.77 for the "Totem" and 12.23 for the "Cutty Sark." It is interesting to find that apparently there is little difference in drag between the strut-braced single engined "Totem" and the cantilever twin-engined "Cutty Sark." THREE-QUARTER REAR VIEW OF BOEING "TOTEM": The "Wasp Jr." engine is installed as a pusher. THE BOEING "TOTEM": An interesting view of this Canadian-built machine in flight. A Retractable Water Rudder is a feature of the "Totem." When retracted the Water Rudder disappears into the Air Rudder. Roomy accommodation is provided for four, including the pilot, Note the dual controls.